A special spice or seasoning can truly make a dish. Without the proper seasonings, a recipe will turn out bland and disappointing. 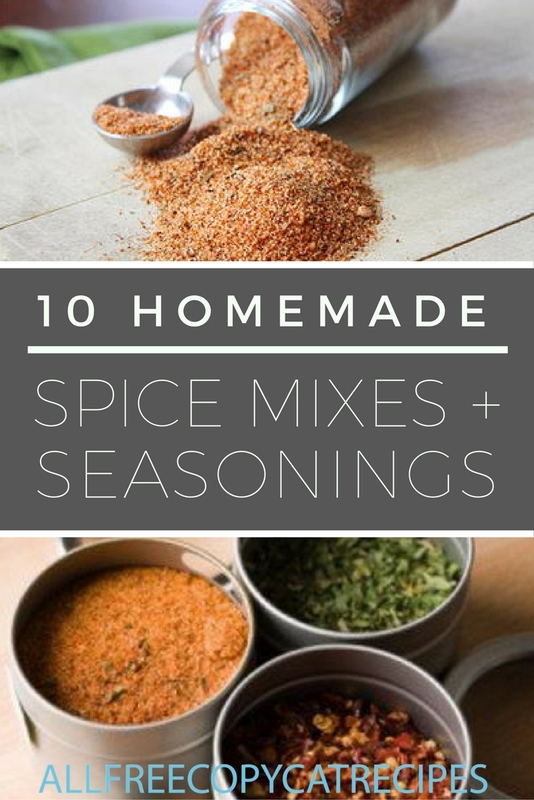 These 10 Homemade Spice Mixes and Homemade Seasonings have all the extra flavors you need to give your recipes the "wow" factor. Making homemade spice mixes and homemade seasonings is incredibly easy by simply mixing a few common pantry ingredients. With these 10 seasoning recipes in your arsenal, you'll be making some of the best food your family has ever tasted. Don't worry; we won't reveal your secret ingredient. There are some spice mixes you only need during the holidays, and others spice blends you think can only be found at your favorite restaurant. These recipes for seasonings will be essential when you start your holiday baking. The recipes can be used in both baking and cooking. This collection also unveils the "secret" ingredients in your favorite restaurant and brand name seasoning blends. A spice mix recipe takes less than 5 minutes to make and will be incredibly handy in everyday cooking. These seasoning recipes also make great edible gifts around the holiday season. Get inspired with these homemade seasonings below. Once you learn the basic ratios needed in each blend, you can experiment with adding your own flavors and spices. These blends will make all your recipes that much tastier. Make it yourself with these 6 Homemade Spice Mixes Everyone Should Have! Homemade Apple Pie Spice Mix - Apple pie spice isn't something you need all the time, but when you actually do need it, then it can't be found. This recipe for the homemade spice mix solves all of your baking woes. DIY Pumpkin Pie Spice - This spice mix recipe will make the best pumpkin pie you have ever tasted! Copycat Good Seasons Italian Dressing Mix - There are certain dressing recipes that are so good, that you wish you could replicate them all the time. Keep this homemade dressing mix on hand and you can have the perfect dressing when you want it! Homemade Taco Seasoning Mix - You have not had amazing homemade tacos until you've used this homemade taco seasoning. This simple spice mix recipe will make taco Tuesday that much better. Homemade Chili Seasoning - A great chili recipe is all about the blend of seasonings. This homemade chili seasoning has all the right flavors to make the World's best bowl of chili. Old Bay Seasoning Copycat - Make this homemade seasoning and you will use it nearly every single day. This spice blend recipe is perfect for grilling your favorite meat or flavoring a stew. Copycat Paula Deen House Seasoning - Paula Deen sure knows how to do seasoning right! Get the same great results that she does with this super easy house seasoning recipe. Red Robin Copycat Seasoning Recipe - Once you see how delicious this seasoning recipe is, you'll want to put it on everything! Copycat Montreal Steak Seasoning - Take your steaks from good to out-of-this-world with these copycat Montreal seasoning. It's truly a game changer. Homemade Red Lobster Cajun Spice Mix - Learn the secret to your favorite spice mix. You will never need to run over to Red Lobster again! Make it from scratch with these 9 Easy Baking Recipes for Homemade Ingredients. What's your favorite spice to cook with?